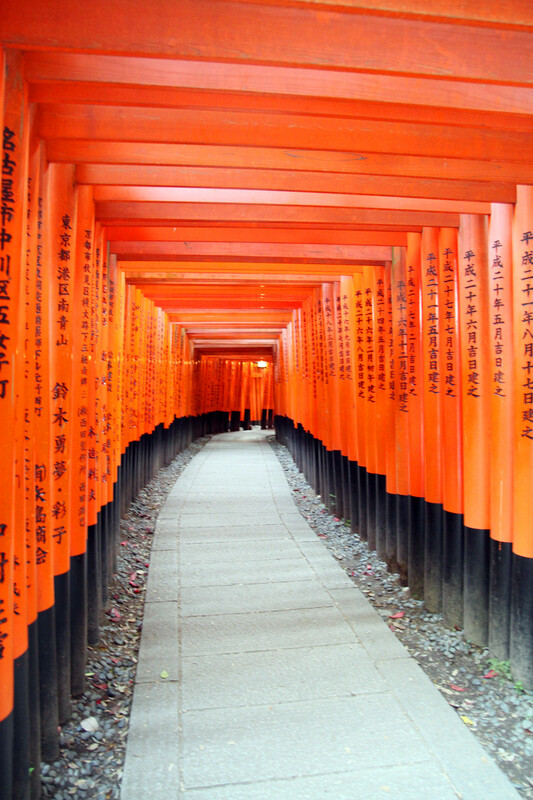 If there’s one thing that screams Kyoto, it would be the red gates at Fushimi Inari-taisha. You know. The tunnel of red that’s on the cover of pretty much every guidebook that every existed. 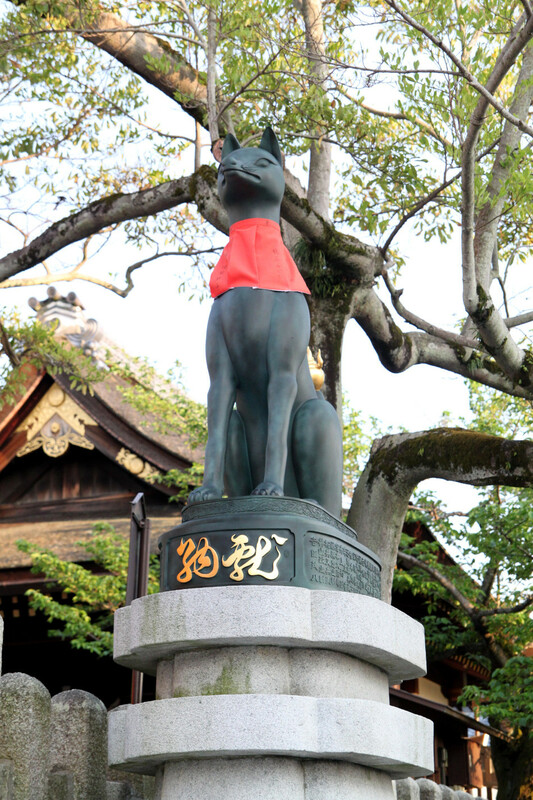 We’re not big on temples and shrines, but you can’t really tell people you’ve been to Kyoto unless you have a photo with the red torii gates to prove it! The red gates line a pathway that goes some 4km or so up the mountain, with plenty of shrines on the way, but as I said, we’re not shrine people (and nor are we fit people) so we only went part of the way before heading back down. 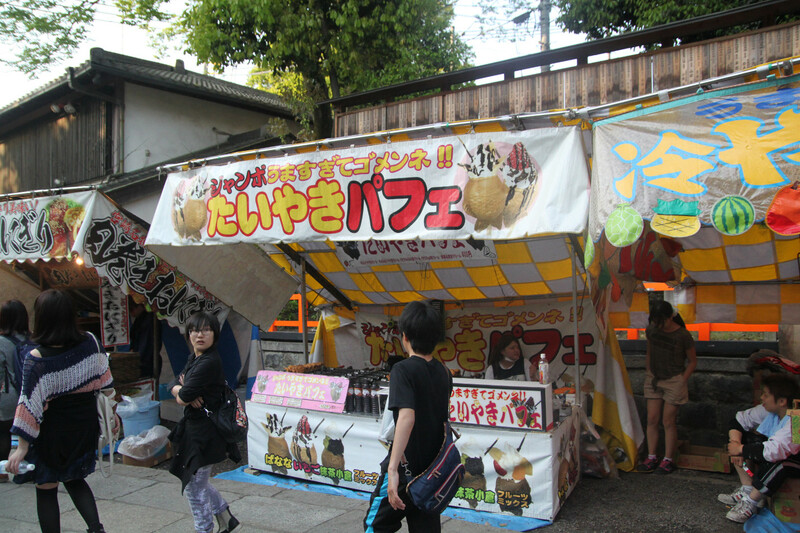 I consider myself much more of a food person (if you haven’t figured out by now), so the market stalls selling food at the entrance to the shrine were of great interest to me! 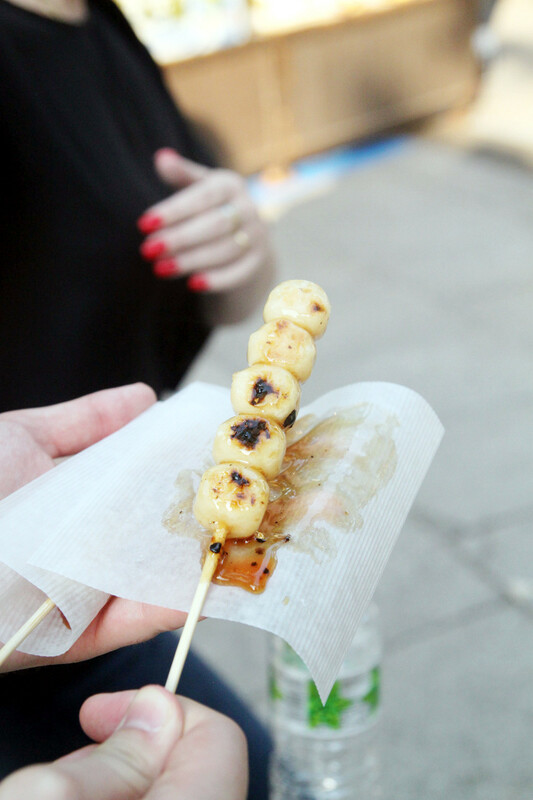 We tried out some Mitarashi Dango – grilled mochi balls on a stick which were deliciously soft and chewy, though the sweet soy glaze was a little on the watery side. 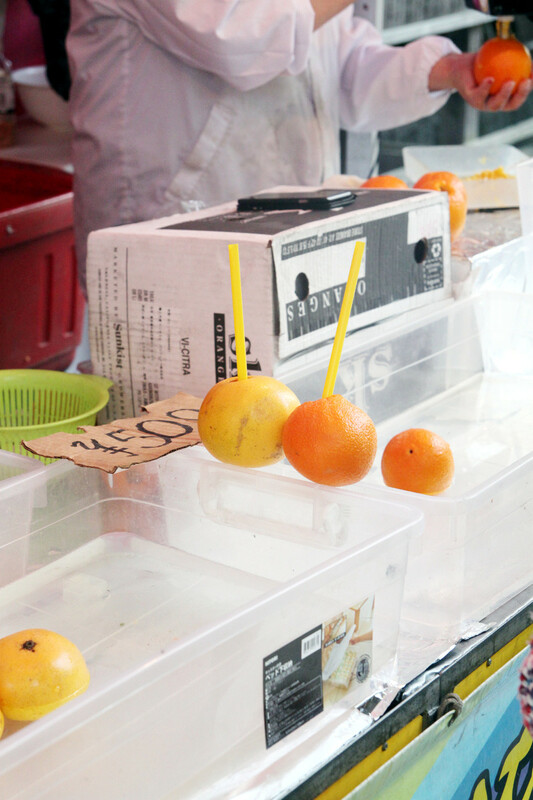 There’s a little bit of everything at the markets, including these cute drinkable oranges. We’re not quite sure how it works, but it sure is cute! 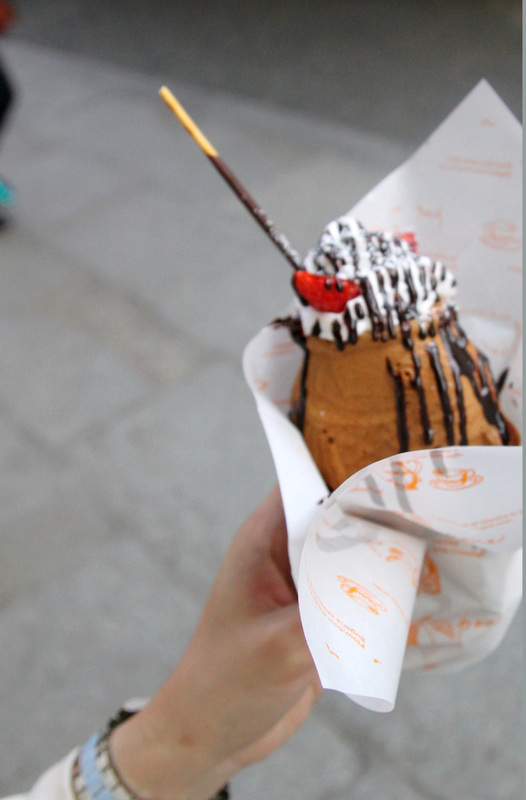 There’s even ice cream Taiyaki, which I’ve wanted to try forever. Unfortunately these are made with cream, not ice cream but they make up for it by filling it with custard at the bottom and covering it with plenty of chocolate sauce. 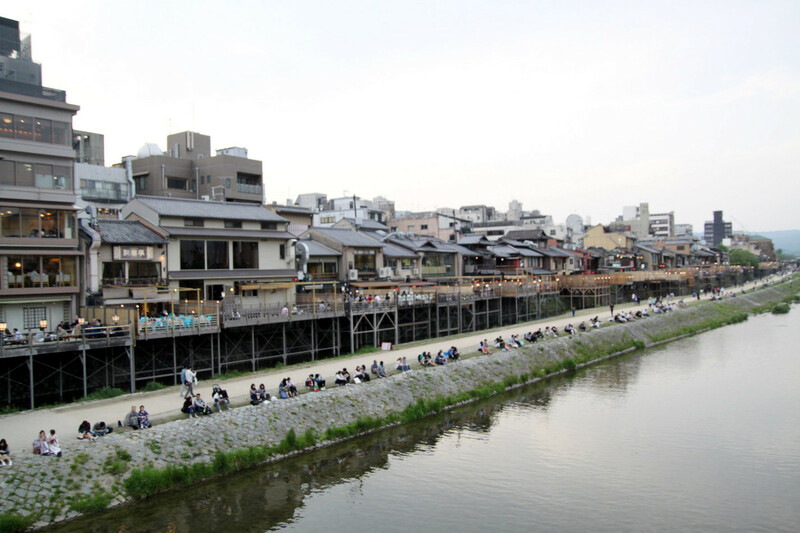 There’s no shortage of matcha cafes in Kyoto, especially in Gion where every second shop seems to be a matcha café or matcha themed shop of some kind. We thought we’d walk a little further to try out Jouvencelle, for their delicious looking matcha fondue but it as luck would have it, we were told that they had sold out of their matcha fondue, and pretty much every other matcha dessert on their menu for the day. 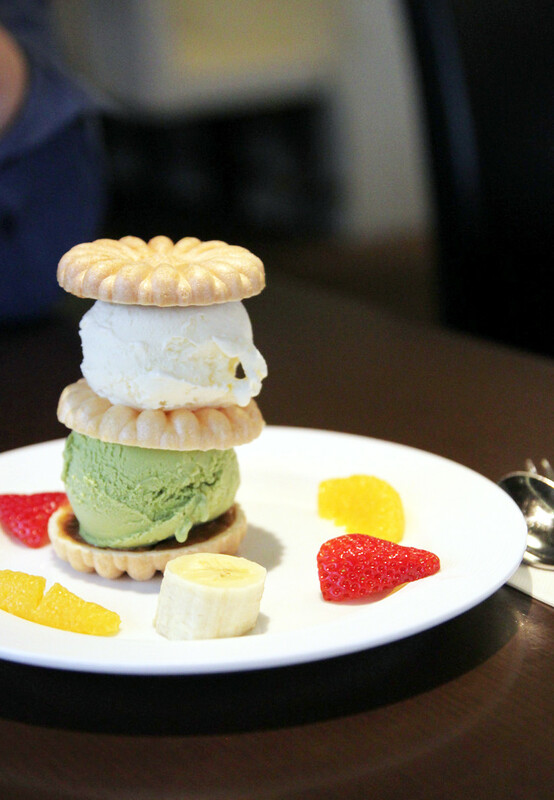 Of the two options left, I chose the vanilla and matcha ice cream stack- two scoops of ice cream sandwiched between three wafer biscuits. The tower was surprisingly sturdy, and the combination of crispy wafer and creamy ice cream was enjoyable, although not the most exciting dessert. We did enjoy the surprising addition of crispy almond caramel hidden inside the bottom wafer layer though! 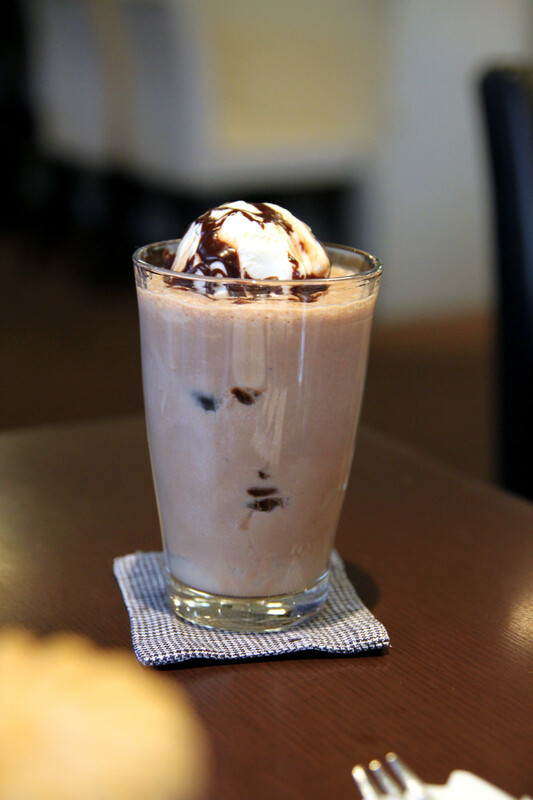 We would have loved to try more of their desserts, but because there was so offer, we ended up going for a chocolate shake instead. 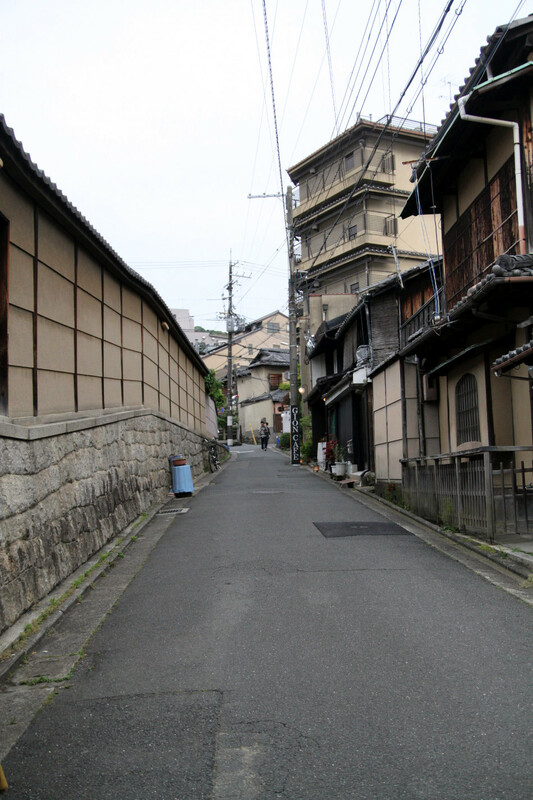 We’ll be back next time we visit Kyoto. And we’ll make sure we visit earlier in the day too! After dessert, it’s about dinner time and there’s an endless array of restaurants with nice views alongside the Kamo river although they tended to be on the pricey side. After walking around for almost an hour we end up at Yaruki, which claims to be the only restaurant in Kyoto that serves real wagyu beef. Whether or not that is true we’re not sure but it’s enough to lure us in. 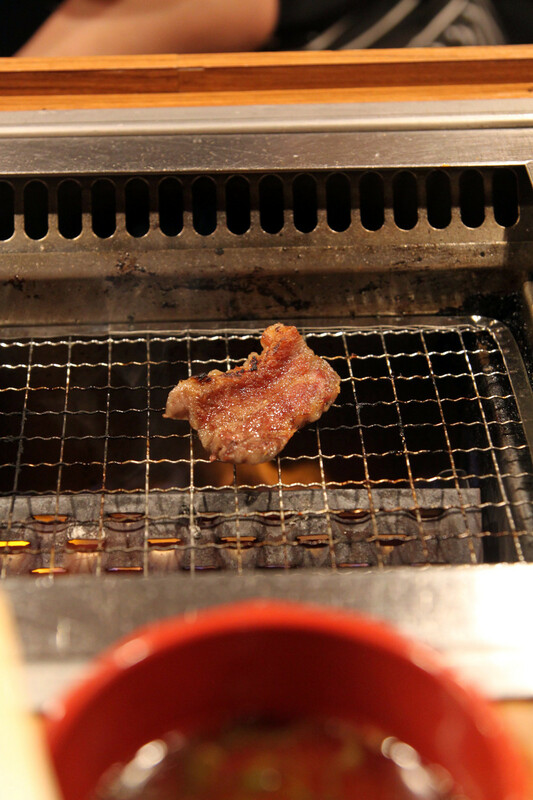 We love the cute little set up, with each diner having their own little yakiniku grill inbuilt into the table. There are instructions on how to best enjoy your meat, with specific instructions for different cuts of meats and sauces so you really can’t go wrong. 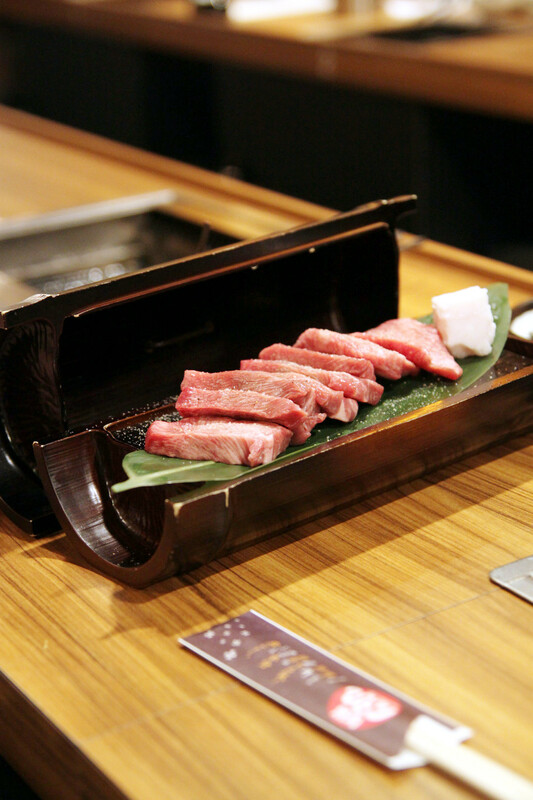 The price of wagyu varies between 3800yen and 12000yen- obviously the more you pay, the better quality you get. We stick to the lower end of the spectrum and try the Kobe Beef Amazing Rib which is as beautifully marbled in real life as it appears in the photo on the menu. We can’t say we were particularly impressed with the texture, as it was a lot chewier than we had hoped, although we suspect the pricier cuts of wagyu are more impressive. 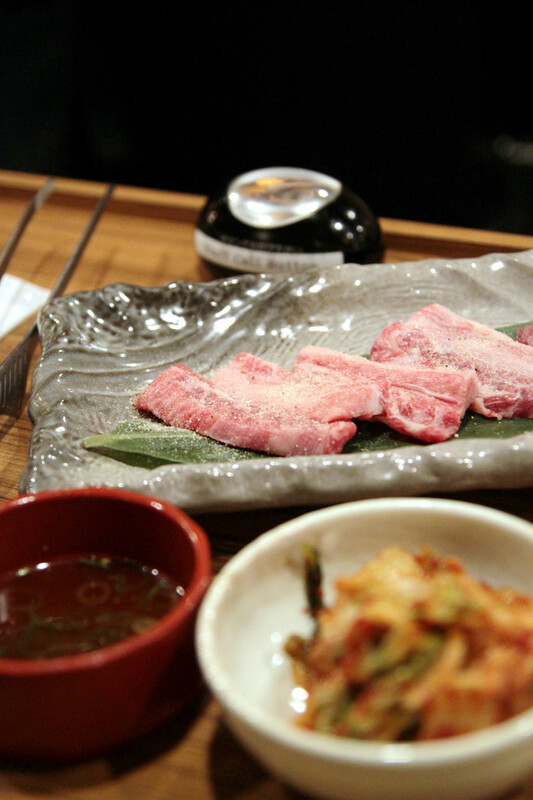 We also try the beef tongue slab, which at 1880 yen, is much cheaper than the wagyu. It is surprisingly marbled, and it did take us a while to figure out which was which- especially as it is served in thick pieces (unlike the beef tongue I’ve had in Australia which is usually sliced quite thinly). 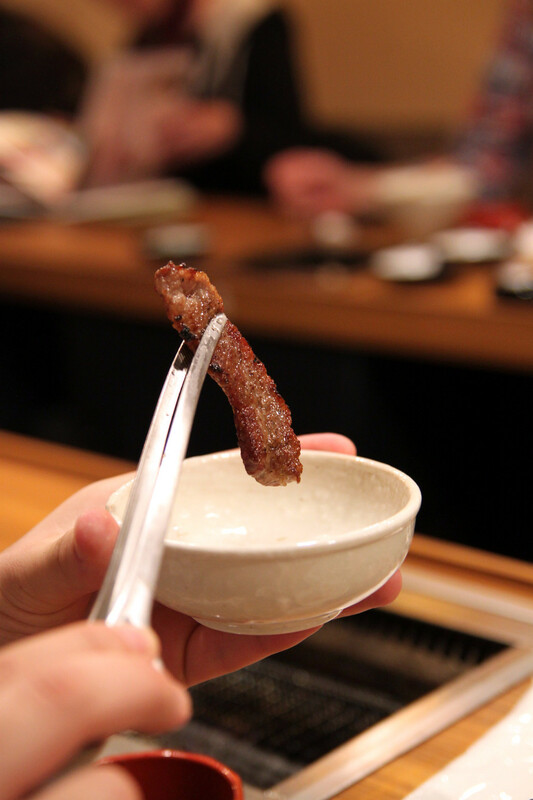 We’re pleasantly surprised – it’s quite unlike any beef tongue I’ve had before and is the clear winner for the night. 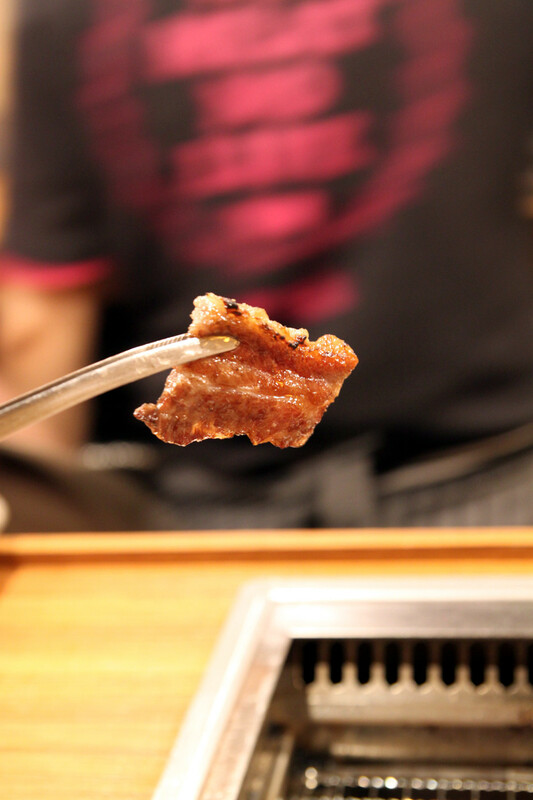 The texture, although not quite melt-in-mouth is surprisingly tender, moreso than the wagyu. We’re not quite full from two servings of meat, so we hop back over to Gion where we have some unfinished business with matcha desserts. 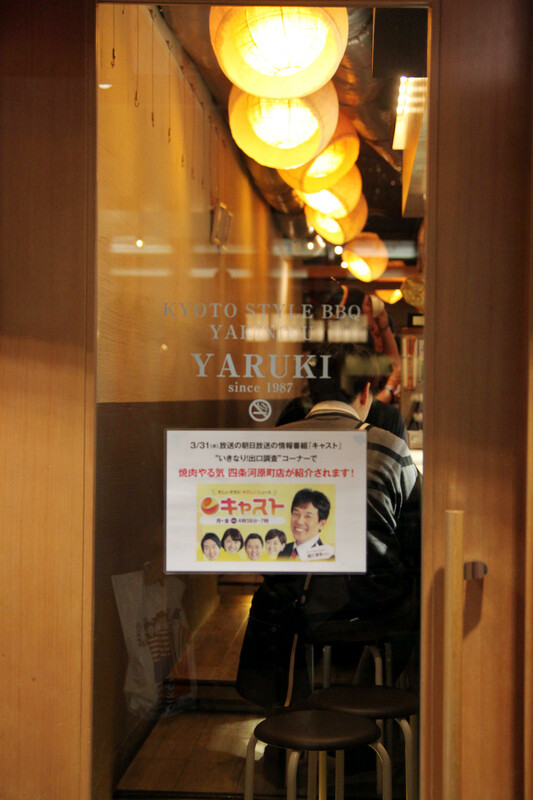 Most of the cafes are closed by dinner time but we were lucky enough to find Saryo Tsjuri Honten was still open- and not only open, but without the massive lines outside that we spotted earlier in the day! The menu is rather extensive- I was only really after a matcha parfait, but ended up wanting to try everything off the menu (if only we had more time!). I had quite a bit of trouble choosing within the parfait section of the menu itself, but ended up choosing the Tsujiri parfait because anything with the restaurant’s name is always a safe bet right? And we were not at all disappointed- with the parfait being easily our favourite dessert of the trip. 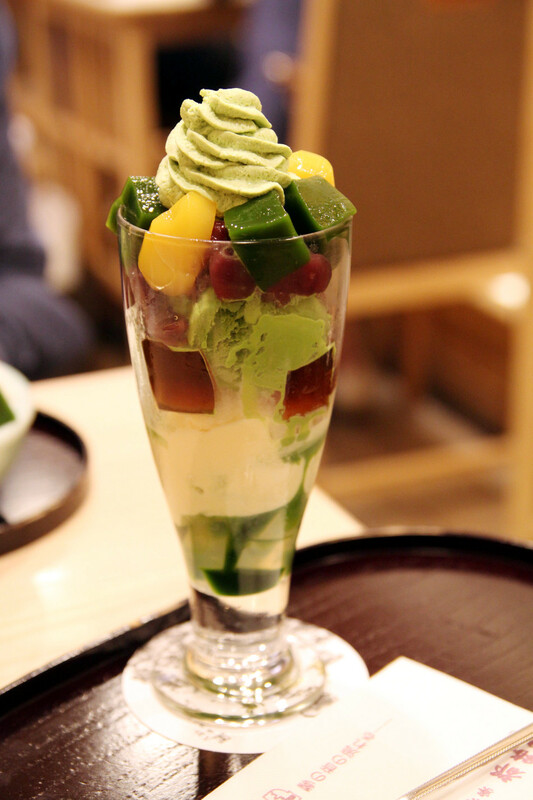 There’s never a moment boredom as you dig through the many components of the parfait, from the incredibly light and smooth matcha whipped cream to the soft matcha jelly, chestnuts, red bean paste, matcha ice cream, hojicha jelly, vanilla ice cream, matcha syrup and lastly the agar jelly cubes. The matcha is layered quite well so that there’s always a bit of matcha with every mouthful, but not too much of it at once. The parfait is quite a big serving and is probably more than enough for two, but we couldn’t pass the opportunity to sample more matcha desserts whilst we were here so we also ordered a shaved ice, thinking it’d be somewhat lighter. We were wrong. But we are glad we did order it because it’s quite unlike most shaved ices I’ve had- this one is incredibly light and soft. You can choose your shaved ice to be flavoured with green tea syrup or milk syrup but we take the best of both worlds and choose the half and half option. You can really appreciate the quality of matcha from tasting the matcha side, it’s a pleasantly bold taste without being overwhelmingly strong and bitter. The milk syrup side is surpsingly creamy, and adds some sweetness to balance the taste of the matcha. 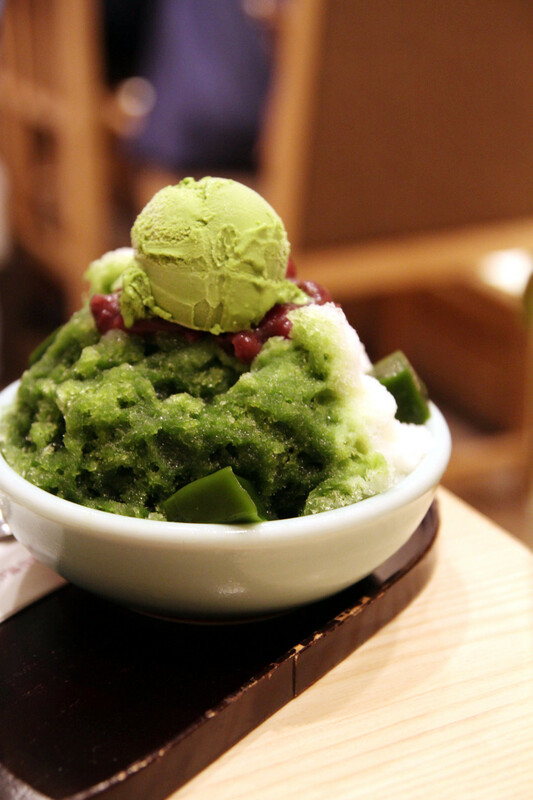 The Tsujiri Gori comes with a sprinkle of adzuki beans on top, which are the perfect accompaniment to matcha, as well as a scoop of creamy matcha ice cream. You know- just incase there isn’t already enough matcha. The addition of rice dumplings (mochi) also adds a pleasant textural contrast. We leave with our stomachs bulging, in a dessert induced food coma and almost rolling ourselves back to our accommodation. But it was so worth it. 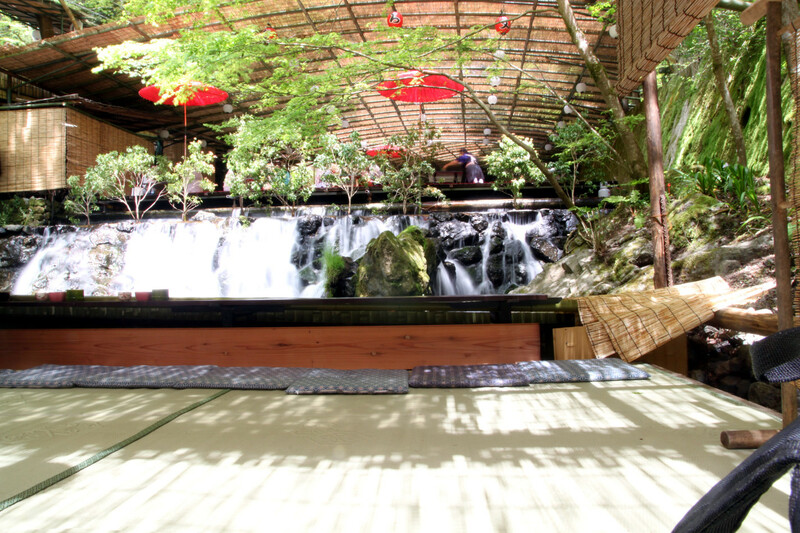 If you ever find yourself in Kyoto, definitely make some time to try out Saryo Tsjuri Honten- it is truly as good as every raving review of it on the internet! And easily my most memorable meal of Japan, it honestly deserves a post of its own. You know what? It will get its own post. We were so adamant in trying Mos Burger when we first arrived in Japan, that we went out of our way with a ridiculously long 30 or so minute walk to rural Narita to get our fix of Mos Burger. 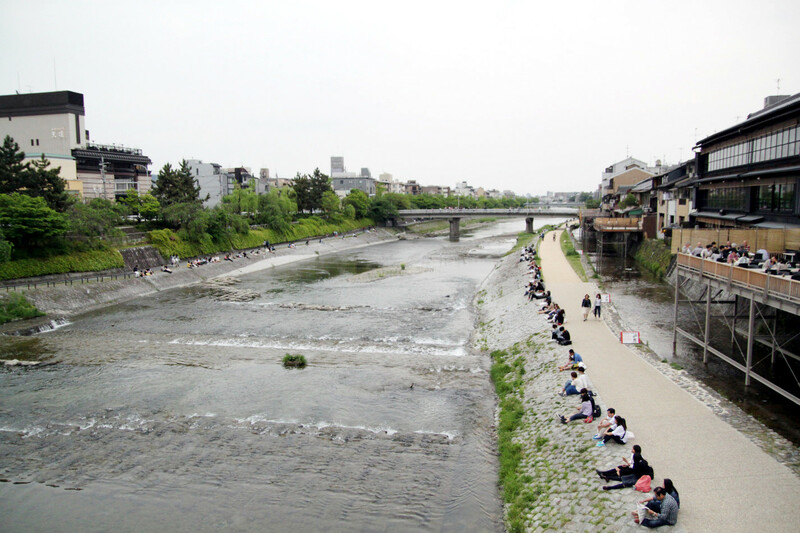 Perhaps we needn’t have bothered considering the chain is just about everywhere in Japan, but somehow the second time we end up at Mos Burger also involved a ridiculously long walk. So much so that we will never forget the day we ended up in this Mos Burger. Call me overdramatic, but we had not one for long walks and after trekking up the long windy sloped road to Hirobun and back we were up for anything other than walking. Our itinerary though, had other plans which involved attempting to chance our way to a silver smithing class (unsuccessfully), walking around the gravel paths of the Imperial Palace (as the daily guided tours were finished for the day) before a never ending walk to Fire Ramen only to find it was closed for lunch. Desperate to sit down, we headed back backwards to the nearest restaurant, which happened to be Mos Burger, where we plonked our tired selves straight into their seats. This time, we tried the Teriyaki Burger which again, was presented just as beautifully in real life as the picture on the menu. 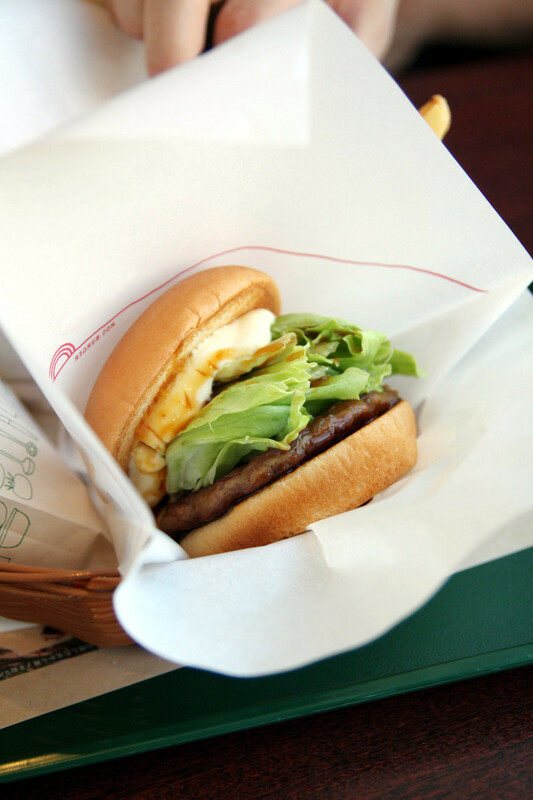 It’s quite a saucey burger, with teriyaki sauce drizzled throughout the burger as well as a generous squeeze of mayonnaise on top. We loved the texture of the burger too- with a perfect balance of sweet juicy meat to fresh and crunchy lettuce. And we couldn’t leave Japan without trying the actual Mos Burger could we? There’s quite a lot going on with this burger, and we struggle to eat it without making a mess. With a tender meat patty, mayo, onions, meat sauce and a perfectly shaped tomato slice sitting between fluffy burger buns, we can’t help but to fall in love with this one. The meat sauce is almost spag-bol like and adds quite a unique taste to the burger. It’s so good grabbed another one.